Windcrest has different size apartments, including studios, 1-bedrooms, 2-bedrooms, and 3-bedrooms. I chose the 2-bedroom apartments, they were exquisite, and I chose a new building that will be done in May. That is when I'm moving out there. It was absolutely gorgeous, I need a lot of doctors, and they have practically every doctor on campus. I only have to go off campus for two physicians. Other doctors come to the campus. They have six different restaurants that I can choose from. It will be a big community when it's done, and it's a thriving community. They have a beautiful theater where they show movies every night, and they have a special room for poker games, Bridge, and a fitness center. It's a buy-in, but the monthly fee was substantially less than other places. The best way to get to know a community is by scheduling a tour. See the facilities, meet the staff and residents, and get a feel first hand what it's like to live at Wind Crest Nursing Homes. Retirement living doesn't get any better than at Wind Crest Continuing Care. Located in the beautiful south Denver suburb of Highlands Ranch, our pristine location takes full advantage of nature's wondrous surroundings. Within our continuing care community, residents will find a lifestyle that lets them be as active as they'd like, with the peace of mind that comes with knowing that a variety of top-notch care options are always availble. Wind Crest Continuing Care is proudly owned and operated by Erickson Living. Since 1983, Erickson has operated vibrant senior living communities that provide a maintenance-free life and resort-style amenities. We don't just build retirement communities - we help people build better lives. Retirement is supposed to be about enjoying life to its fullest and not worrying about little stresses. That's exactly what happens the moment a new resident enters our doors at Wind Crest Continuing Care. From a chock-full activity schedule and varied social clubs to our putting green and heated indoor pool, every aspect of our community lends itself to a fun, active lifestyle. Our full range of continuing care options, including assisted living, nursing care and memory care, ensure that our residents will always be a part of our community. 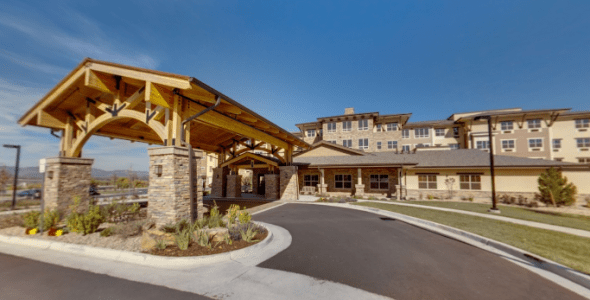 There's even an on-site medical center, as well as many other conveniences all located within the Wind Crest Continuing Care community. Assisted living residents get assistance with life's daily activiteis, including meals and medication management, in the privacy of their apartment home. And for seniors living with dementia, our memory care community features a dedicated, expert staff, private residences and a unique building design that encourages engagement and independence. After a lifetime of work and worry, older adults deserve a place to enjoy an exciting, active retirement that also includes top-notch care. That place is Wind Crest Continuing Care.